There are 20 rooms for one or two people in three different standards in Hotel-24 Płock: Twin, Lux and Standard and 1 room for four people with kitchen annex. All rooms are equipped with ensuite bathroom, TV with satellite channels, radio and free Wi-Fi. Although our hotel is situated in the center of Plock, just next to main Warsaw - Płock route, we guarantee you a comfortable stay in a completely secluded area away from traffic noise. Our facilities consists of: 8 double rooms, 12 single rooms and 1 four person apartment. Free breakfast and parking included in the price of the room in Hotel-24. We assure you that regardless of your chosen room the price of each includes a full breakfast in the form of buffet in our restaurant and around the clock monitored parking space. * Our standard hotel rates are valid from Monday to Friday, we have special offers from Saturday to Sunday. Each of our hotel double rooms is equipped with single bed, wardrobe, desk with a chair for work and a night lamp. Single rooms have ensuite bathrooms with a washbasin, big well lit mirror and a glass shower. For our most demanding guests we have designed a comfortable, well-equipped rooms of a higher standard. Each has its own bathroom with a modern shower with massage function, a plasma TV and a large double bed. The room has a built-in wardrobe and a comfortable desk to work. Double rooms in our Hotel are equipped with comfortable, single beds, double wardrobe, table with a chair and a big LCD TV. Both single and double rooms have ensuite bathrooms with a washbasin, big well lit mirror and a comfortable shower. 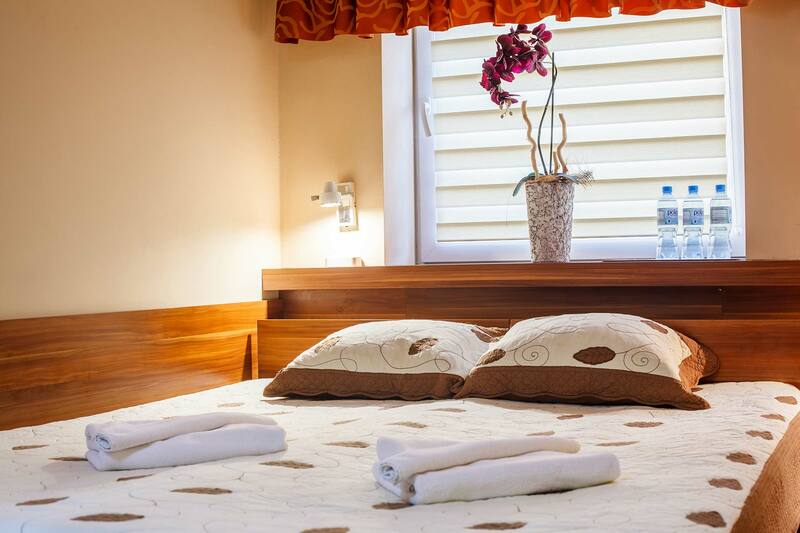 At your disposal we offer a comfortable, traditionally furnished quadruple room with its own, independent kitchenette, LCD TV and a large wardrobe. Included in the standard, among others, spacious, modern bathroom with large shower, washbasin and well lit mirror.